OPINION: Five days of monitoring BOM warnings, talking to meteorologists and writing stories about the weather didn't prepare me for what I witnessed yesterday. Just minutes into our drive around town, to check out what the weather was doing and survey any damage so far, Observer photographer Paul and I were caught off-guard by flood waters. 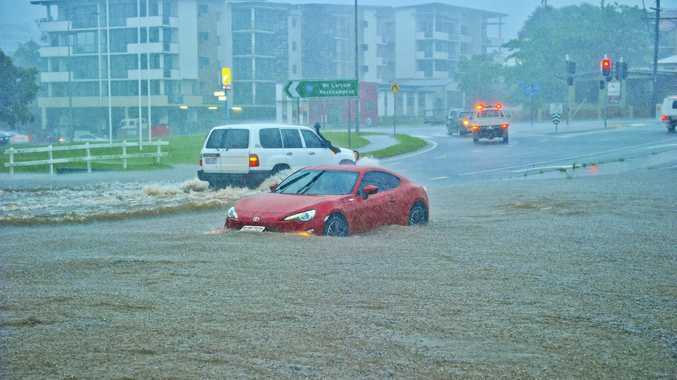 Gladstone floods: Reporter Emily Burley at the scene of flooding at the Glenlyon Rd/Dawson Hwy intersection, Gladstone. What looked like a small amount of water on the Dawson Hwy turned out to be much deeper, so we pulled off the road into a raised car park. That may not have been the best decision, however, with the water rising by a number of feet in just minutes, leaving us stranded. We had no choice but to ditch the car and wade through the water, which was now well above our knees, to get out. We weren't the only motorists caught out, with another driver becoming stuck in the water - unable to drive through or reverse out. Gladstone floods: Flooded on the Dawson Hwy, Gladstone. As always, our emergency service workers should be commended. Yesterday and every day, they put themselves in potentially dangerous situations while protecting the wider community. Gladstone police responded quickly when called to the flooding on the Dawson Hwy, as they no doubt did with a number of incidents across the region in that dramatic couple of hours.